The I Love MCR boys sample the simple, rustic and traditional food and drinks at The Oast House, Spinningfields, for a ‘proper lads night’. Having had a productive day in the office, we decided to do a bit of male bonding, Joey & Chandler style (we are just as funny, honest). Having a real ‘guys night’, we wanted thick juicy burgers, tasty kebab skewers and a few bottles of beer, no nonsense or fancy pants. It’s pretty obvious that the Living Ventures group owner Tim Bacon likes his rustic, country pub feel. It bodes well for us. The Christmas Teepee had been taken down for obvious reasons. Much like cheese and Port, there’s some things best left exclusively for Christmas. The garden area was completely redundant on this perishing winters evening. Neither of us smoke, anyhow. We sat down in the dimly lit, warm and cosy gastro pub. Entertained by Tony Nichols, the companies resident pianist, playing a medley of songs old and new (Monday’s 7-9pm), we knew we were in the right place. It’s a fairly new establishment that has gone for the worn-in look, giving the impression that it has thick roots. It feels like a log cabin, Ginger thought it looked German, Mr Dubai went for Swedish. We compromised and settled with European*cheers!, argument settled. A log fire wouldn’t of gone a miss. In fact, it’d be quite fitting. Starting off with a couple of beers, we were slightly overwhelmed by the choice. With 17 different options, presented in a notebook with a bit of history and descriptions. The choice has been compiled by ‘Warren The Beer Guru’. We ended up going for Adam’s recommendations, The Brew Dog IPA (light and pale) and Peroni, which suited us down to a tee. 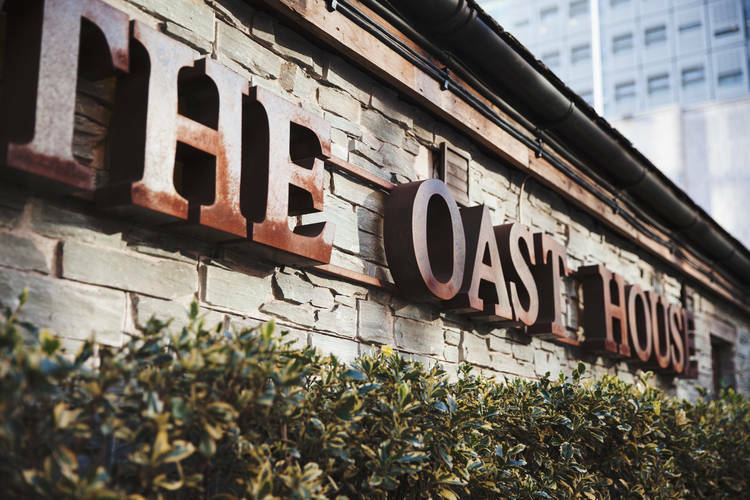 The Oast House is the decent setting for anyone looking to improve their knowledge and palette of local and world famous beer. They hold Ale and Beer Taste Masterclasses, ideal for those looking for something a bit different for a group activity or as part of a corporate hospitality event (minimum party of six people). With no starters to worry about, we got stuck straight into our mains. We knew what we wanted before we even got there. For Dubai, it was definitely the award-winning Beef Burger (a very reasonable £8.95), which is barbequed fresh to order and cooked to your liking. He went for medium. It’s presented in a grease paper lined, wooden box (LOVE it). It was thick, juicy, and very, very tasty. It seemed to effortlessly break up in the mouth, but still remained succulent. Probably the best burger he’s had in Manchester. It was garnished just right too, and came with chips, but these aren’t just chips… We’ll get on to that later! Washing down each mouthful with a swig of beer, we couldn’t BE any happier! So, the chips, if Janice from Friends had these chips, we are sure the words “OH. MY. GOD” would be spouting from her screechy voice. They are thin cut, seasoned with garlic, sage, salt and pepper, and cooked to perfection. They taste amazing, and really compliment the mains. We also had a side of corn on the cob and olives as we were feeling particularly greedy, which were great too. They do Deli, Ploughman’s and salad options too (average £8.95) that are presented in a fashion Jamie Oliver would be proud of (probably with less leaves and olive oil, mind you). The portions were big enough for normal humans, but as we were feeling particularly pig-ish, we had to try out the desserts. There is little choice, it’s clear desserts aren’t the main focus of The Oust House. Ginger went for the Bakewell Tart (it’s the only tart he’s getting near to tonight), which is a pretty northern dessert and he was feeling particularly northern. Dubai opted for the Warm Chocolate Fudge Cake, which was very thick and chocolatey. Both desserts served on pretty, traditional plates that look very ‘country’ (pictured). We noticed a huge pan labelled ‘Honey Spiced Cider’ and being a fan of mulled cider, we obliged a sample. It was originally limited for Christmas but considering its popularity they’ve left it on as more of a permanent indulgence. It really was b-e-a-utiful, to the degree that it would almost be worth standing in the cold to sip and ‘warm your cockles’. After yet more beer we try to work out how to actually pronounce the name, coming to the conclusion that it’s like ‘toast’ without the ‘t’ – That’s man logic for you. With a night cap of JD Coke for Dubai and a Gin & Slimline Tonic for Ginge for he’s on a diet (besides, he can’t drink Jack, as last time he ended up getting into bed in the wrong apartment), we had a chat with Adam, part of the senior management team. It’s clear these guys all follow the same ethos. They are very customer service and career orientated. On the love-o-meter, The Oast House is your beer buddy that you can call up any day of the week for a good time.